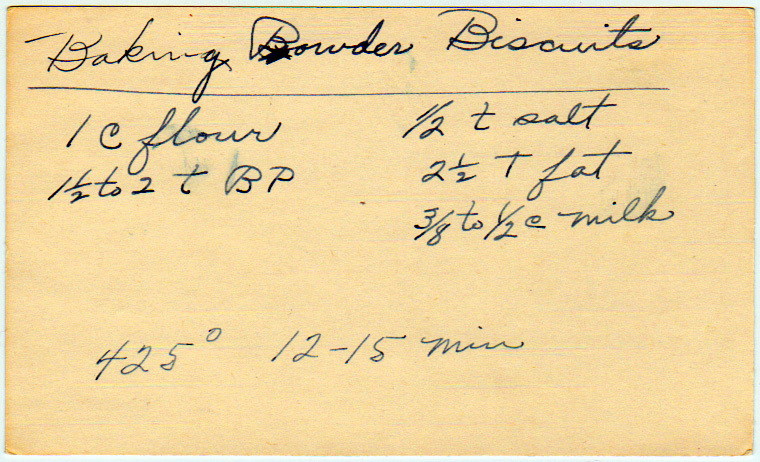 The piece, attributed to Ann Page, goes on to explain that the ingredients of baking powder biscuits are “flour, salt, baking powder, shortening and cold water or milk,” and that milk makes a softer biscuit with more “food value” while water makes a crustier biscuit. Ann Page sounds pretty smart. But then, she probably would, given that she’s a nom de plume for the home economics department of the A&P Grocery Store chain. While A&P was short for The Great Atlantic and Pacific Tea Company, founded in 1859 in New York City, its Ann Page trademark was placed on store-brand goods produced in a factory in Horseheads, New York, a little north of Elmira. For what it’s worth, while the Ann Page brand has been produced only sporadically since the 1980s (the manufacturing facility closed in the 1980s, but the name was used from time to time on private label goods), the Ann Page legacy is alive and well. In 1931, A&P started collecting these columns and distributing the collections within the stores to inspire homemakers (which is to say, women, in the 1930s), to buy more goods. By 1937, the publication, dubbed Woman’s Day, was being sold for two cents a copy. By the time A&P sold Woman’s Day to a publishing company in 1958, it had a circulation of 4 million–impressive, given that the publication had only been sold in A&P stores. Today, Woman’s Day has a print circulation of 3.8 million and over two million people visit its website every month. Not a bad legacy, for a fictional girl from Horseheads.